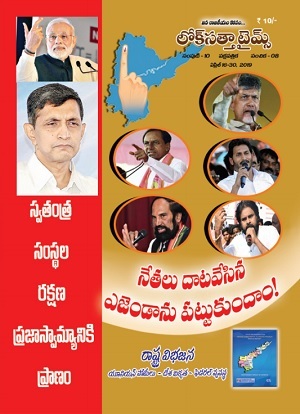 Some of the top leaders of the non-partisan Surajya Movement began a three-day Jana Chaitanya Deeksha at Dharna Chowk near Indira Park today with a view to mobilizing public opinion on achieving good governance which has eluded them since the country attained Independence 65 years ago. 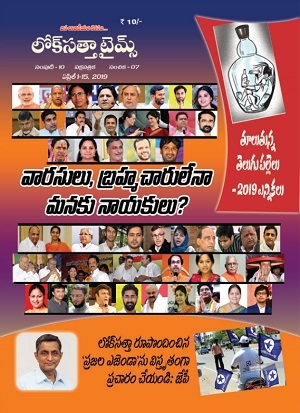 “Our movement is directed neither against political parties nor the Government.Our fast is not meant to garner sympathy or blackmail anybody,” said Dr. Jayaprakash Narayan, who is heading the deeksha as Convener of the Sursjya Movement. “It is meant to dispel despair, ignorance and innocence of people so that they can fight for what is legitimately due to them,” Dr. JP added. Congress, TDP, CPI, CPI(M), TRS leaders who took part in the meeting expressed their solidarity with the Surajya Movement. The Surajya Movement demands the institution of a strong, independent Lokayukta at the State level to combat corruption, enactment of citizen’s charters to provide basic services as their right, devolution of 10 percent of the State budget to village panchayats and municipal wards and extension of quality healthcare and education to all irrespective of the accident of their birth in a certain caste or community. Dr. JP said the Surajya Movement demands can be conceded straightway since they are non-controversial. The Government, however, concedes them only when enlightened people fight for them. Dr. JP said that in the next phase the Steering Committee will train up to one lakh youth to carry the Surajya Movement to every nook and corner. Mr. Kaki Madhava Rao, former Chief Secretary and State Election Commissioner, said that good governance can be achieved if citizens take the initiative, instead of leaving the job to leaders. He instanced how people’s movements have dethroned despotic regimes in West Asia in the recent past. Initiatives of a few concerned citizens like Dr. JP have resulted in the passage of the Right to Information Act and election law amendments enabling voters to know the antecedents of candidates in the fray. Mr. Madhava Rao recalled that on one of his visits to his native place as Chief Secretary, the villagers asked him what the Chief Minister was doing to curb corruption by pointing out that the village munsif collected Rs.300 for issuing a caste/income certificate. He told them that if 3000 people in the village could not confront the village munsiff, how they could expect the Chief Minister to tackle corruption in 30,000 villages in the State. Chief Ministers, he said, put in cold storage files recommending action against the corrupt when legislators or ministers exert pressure in sheer self-interest. There is no reason to lose hope, Mr. Madhava Rao said, recalling that Georgia had become one of the least corrupt countries in the world in just seven years following a peaceful revolt by people. A clap on the mountain top can unleash an avalanche, he said underlining the need for people’s initiative. Ninety-year-old freedom fighter and veteran politician Chennamaneni Rajeswara Rao regretted that the dreams of Mahatma Gandhi and other freedom fighters for Surajya have eluded people even 65 years after independence. He called for a massive movement transcending all political parties for good governance. Thousands of people from all walks of life, especially youth and college students visited the venue of Janachaitanya Deeksha to extend support for the movement. An attractive exhibition on Surajya full of cartoons has become a key attraction. Mr. Eetela Rajender of TRS, Dr. Lakshman of BJP, Prof. Nageshwar, MLC, Mr. P. Madhu of CPI(M) and Mr. Ramakrishna of CPI were among those who extended their support to the movement. The following joined Dr. JP in observing fast on the fast day: Karthik Chandra, Shyam Sunder Reddy, D.Somasundar (President, APUWJ), Bhaswant, N. Karthik, E. Vamsi, Elizabeth Seshadri (Tamilnadu), K. Anjaneyulu, Praveen (Tamilnadu), S. Raghavulu, Mrs. Annapurna, T. L. Narasimha Rao, ARK Chowdary, Muralidhar and Uppu Sudhakar. Poet and singer Vangapandu Prasada Rao, noted writer and singer Nisar and their teams rendered Surajya songs. JP, re: "fight for what is legitimately due to them", I'd suggest this movement be focused on liberty and less intervention by government, not on what is "legitimately due". The ONLY thing legitimately due is defence, police and justice. These things everyone is entitled to. Anything else has a strong socialist flavour and needs to be severely qualified, lest the listener rushes to the view that you are recommending communism.